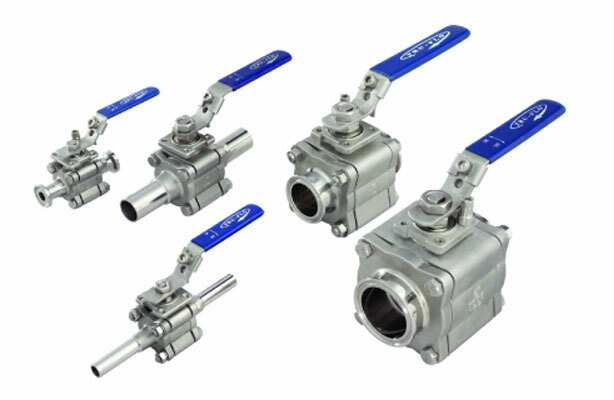 IPS has a large variety of sanitary valves to meet your valve requirements. The food, beverage, and other sanitary markets require special equipment that is designed to be cleaned easily and meets FDA & other governing agency approvals. We offer sanitary valves, sanitary pumps, sanitary sensors and special systems such as reverse osmosis that are required in many of these applications. Our sanitary valves, pumps, & sensors meet 3A approval required by most food, beverage, and pharmaceutical industries. The sanitary ball valves is the most popular configuration we supply and be supplied with optional cavity filled seats which prevents the media from getting trapped in the seat area. These style valves are also used in the paint industry where silicone free is a must to prevent fish eyes in the paint when applied. Sanitary pressure, sanitary temperature and sanitary flow meters are all available in 3A ratings, economically priced, and some of the best deliveries in the market. Reverse Osmosis systems are turn key and available in 1200 gallons per day up to whatever a plant may require. These are very economical and prepackaged for industrial use such as providing RO water for food & beverage, cosmetics, industrial applications to prevent spray nozzles from clogging.